Steak Diane is one of my favourite steak recipes. One of those oldies but goodies I’ve been making for decades. 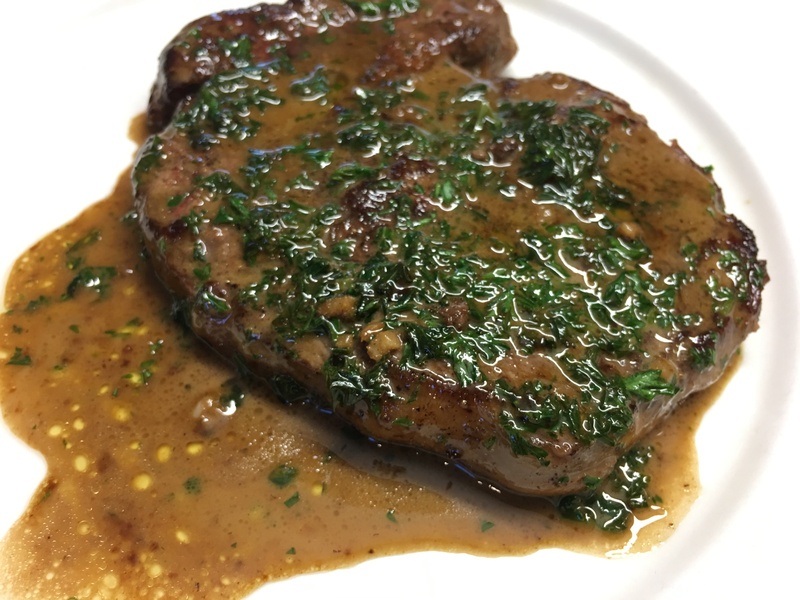 I’m trying to cut down on carbs at the moment and Steak Diane is perfect for a low carbohydrate, also known as a ketogenic, diet. It’s quick and easy and uses ingredients I always have on hand. Served with a green salad or some steamed green beans, snow peas or broccoli it makes a satisfying meal. Family members who aren’t avoiding carbs will appreciate a few chips (French fries) on the side. I usually have a packet of bought ones in the freezer and find they crisp up in a very hot oven in the time it takes to cook the steak and veggies. If you want to cut down a bit on the calories use half the amount of butter. Pound steaks to 1cm thick with a meat hammer and season on both sides with pepper. Heat butter on high in a non-stick frying pan and when sizzling add steaks and cook for one minute. While steaks cook on one side rub the crushed garlic into the other side. Turn steaks over, add Worcestershire sauce and swirl steaks around in the sauce. When done to liking – for me pretty much immediately – add cream and parsley, cook for a minute or so to thicken the sauce. Turn steaks over and back again, to coat them with the sauce. I recently caught up with my friend Julia over a delicious lunch at The Palette Café. Inevitably the conversation got onto food and how we both love beetroot. I said we had grown some last year with mixed success. “Ah” said Julia “I have the solution”. The trick is to soak the seeds overnight in tepid water and then plant the drained seeds in potting mix in cardboard toilet roll holders. Once they are up plant the seedlings, toilet roll holder and all, into the soil. Julia grows zucchini and pumpkin the same way. Word went out that Matthew needed empty toilet roll holders and before you could say Jack Robinson friends and family all over town were coming to the rescue. It’s interesting to see how many some families go through in a week and how abstemious others are by comparison. On this subject Matthew quotes a statistic from his time in the Australian Army. Requirements were calculated on the basis of seven and a half squares per man per day. With a lot more women in the military these days they’ve no doubt had to throw those figures out the window. While on the subject of beetroot Julia promised to send me her recipe for Veal Burgers with Beetroot Relish which she cut out of the local newspaper some time ago. If you don’t have veal use beef, pork or chicken mince. If you are unable to buy Tzatziki either make your own – there are plenty of recipes online – or just leave it out. 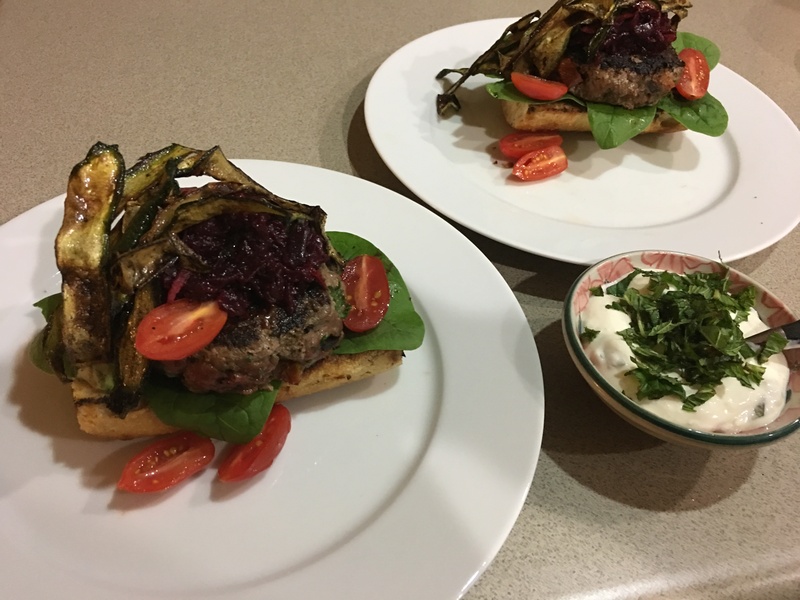 The burgers are almost as good served with just the Beetroot Relish. I used English mustard instead of Dijon in the relish and doubled the amount from half to one teaspoonful. The coarse (0.5cm) grating disc attachment on my Magimix made short work of grating the apples and beetroot. The recipe says to leave the relish for 3 weeks to mature before using. I think we gave ours about 30 minutes! It was still scrumptious and there’s plenty left over for the next batch of burgers! Mix all ingredients for burgers and form into four patties. Cut zucchini into long ribbons and mix with the oil. Heat a barbecue, griddle pan or non-stick frying pan and cook the burgers for about 5 minutes each side or until done to your liking. Cook the zucchini strips on both sides on the same barbecue or in a second frying pan, until golden, then drain on paper towels. Arrange a few spinach leaves on one half of the toasted buns or baguette, then the burgers. Garnish with tomatoes, zucchini ribbons and some Beetroot Relish. Mix the mint into the Tzatziki and serve separately. Place beetroots in a saucepan, cover with water, then cook for about 40 mins or until tender. Cool, peel, then grate coarsely. Peel and coarsely grate the apples. Heat oil in a heavy-based saucepan and gently cook the onion and garlic until soft but not brown. Add the apple and remaining ingredients, except the grated beetroot and cook for 10 minutes or so, until cooked down. Then add the beetroot and continue to cook for about 30 minutes until thickened like a relish. You’re supposed to remove and discard the piece of orange rind, but I finely chopped it and mixed it back in. Pour into clean sterilised jars and seal while hot. If possible, leave for 3 weeks to mature before using. To sterilise jars place them in the microwave on High for 2 minutes without the lids. 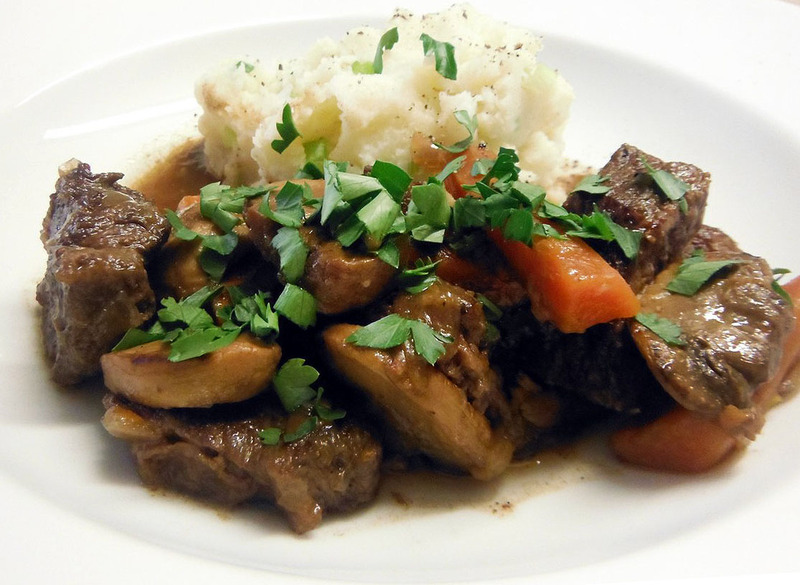 A good beef casserole accompanied by mashed potatoes to mop up the gravy is the sort of comfort food we all crave at times, especially as the weather gets cooler. These old-fashioned dishes take us back to our childhood and Mum’s cooking. This casserole doesn’t contain any tomatoes or herbs, allowing the flavour from the mushrooms and the sherry to shine through. It can be made in the oven or in a slow cooker. 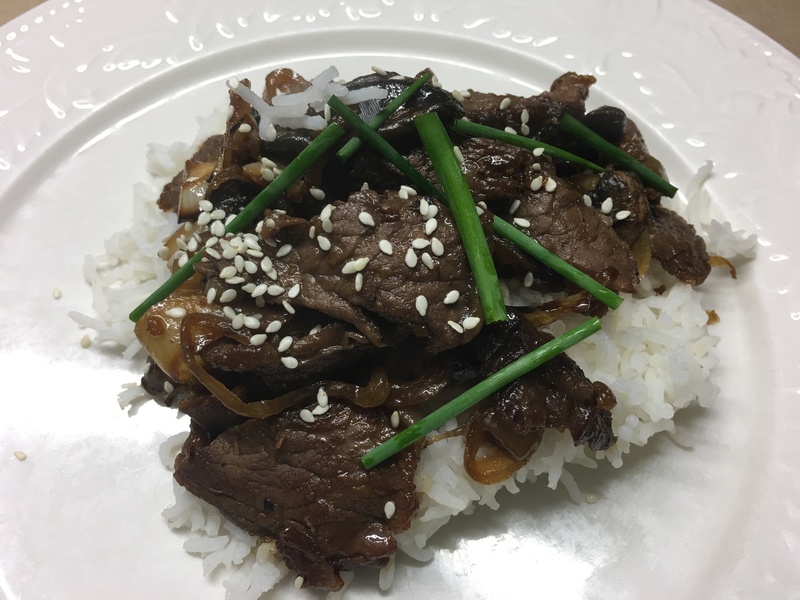 Trim beef and cut into 3cm cubes. Season. Heat 1 Tbs oil in a large frying pan and brown half the meat all over until nicely caramelised. Put beef into a heavy Le Creuset-type casserole with a lid or into a Slow Cooker. Repeat with remaining oil and beef. Add the lardons to the pan and cook, stirring until light brown. Add onions and cook for 3-4 mins stirring regularly, until starting to soften. Add carrots, mushrooms, garlic and a touch more oil if necessary and continue to cook for 3-4 mins. Tip vegetables into the casserole with the beef. Add water, stock cube, Worcestershire sauce and sherry or wine. If using a casserole dish cover and cook at 150°C for two hours or until meat is tender and sauce has thickened up. If using a Slow Cooker use only one cup of water, cover and cook for 3-4 hours on High or until meat is tender and sauce has thickened. Casserole will keep in the fridge for 3-4 days or you can eat half and freeze the rest. Reheat, check seasoning and serve garnished with chopped parsley and accompanied by Spring Onion Mash to mop up all the gravy. Spring Onion Mash: cook potatoes in boiling salted water for 20 mins or until tender. Drain thoroughly then mash with a potato masher, adding the butter and milk. When smooth and creamy season with salt and pepper and fold in the spring onions if liked. When I told No. 2 son I was making a lasagne without pasta he was skeptical. You’ll be trying to get rid of the leftovers all week, he said. But it was a great success. 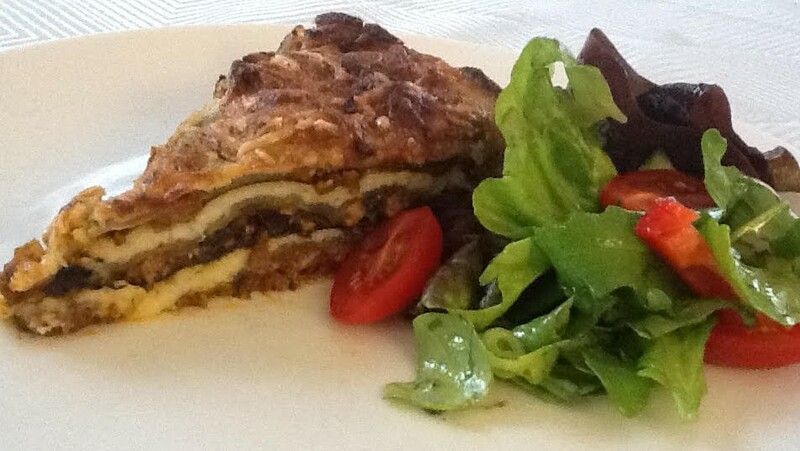 Different to a traditional lasagne, but still delicious. It comes from a new book called Simplicious which is all about using things up. 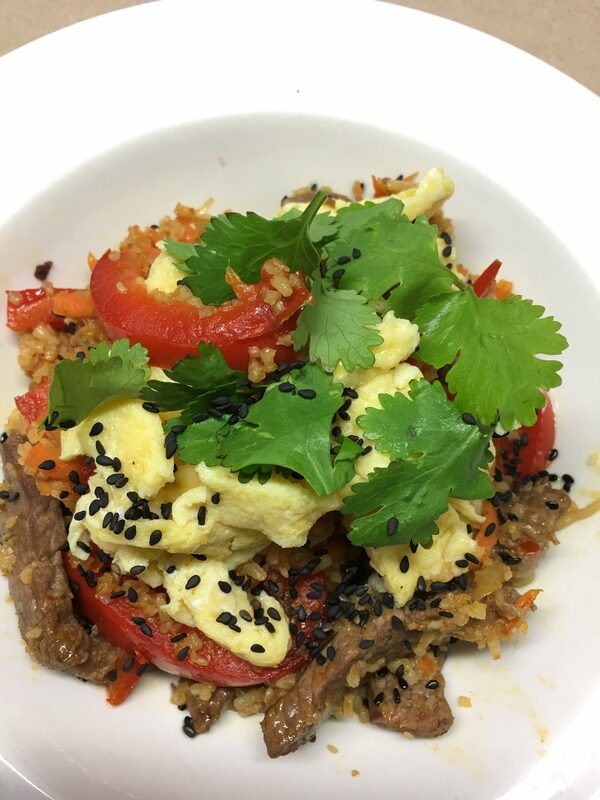 It uses rice paper sheets instead of lasagne sheets and the sauce is thickened with cauliflower instead of flour, making it gluten-free and low in carbohydrates. But if you don’t have any rice paper sheets use any kind of pasta you have in your pantry – cooked in boiling water, unless it’s instant lasagne. I’m not gluten intolerant, but you don’t need to be gluten intolerant to enjoy this recipe. It simply caught my eye because I had some rice paper sheets and nori (seaweed) sheets which had been sitting in the pantry forever and needed using up! I added cumin and sugar to the sauce and used mushrooms instead of grated pumpkin. Below I’ve offered a few other suggestions for varying the recipe to suit what you have on hand. It’s that kind of recipe – very adaptable! Heat oil in a large frying pan and cook onion, mince, mushrooms and garlic for 5-7 mins, stirring often and breaking up the mince. Add remaining ingredients and simmer for 15-20 mins until thickened. Meanwhile pre-heat oven to 180°C. Cook cauliflower in boiling salted water until tender then place in food processor with butter, milk and Parmesan. Whiz till smooth. Grease a 22cm springform cake pan and line the bottom with baking paper. Spread a third of the meat sauce over the bottom, then 3 rice paper sheets, then a third of the cauliflower sauce. Next goes half the spinach leaves and half the nori. Repeat this again then finish with remaining meat sauce, rice papers and cauliflower sauce. Top with grated Parmesan. Bake 40 mins or until browned. Stand 10 mins then remove sides of pan. Serve with a mixed salad. Use grated cheddar instead of Parmesan. The original recipe uses 2 cups of grated pumpkin – I used mushrooms instead – you could also substitute grated carrot or zucchini (courgette). To make a vegetarian version use 500g eggplants (aubergines) cut into small cubes instead of the mince. If you don’t have any nori (seaweed) sheets just leave them out. When we had a house full of kids I made recipes using minced beef all the time. Lasagne, spaghetti bolognese, shepherd’s pie – they are all great ways to feed a family with just half a kilo of mince. Now there’s just the two of us I only buy mince occasionally – otherwise we’d be forever eating leftovers! 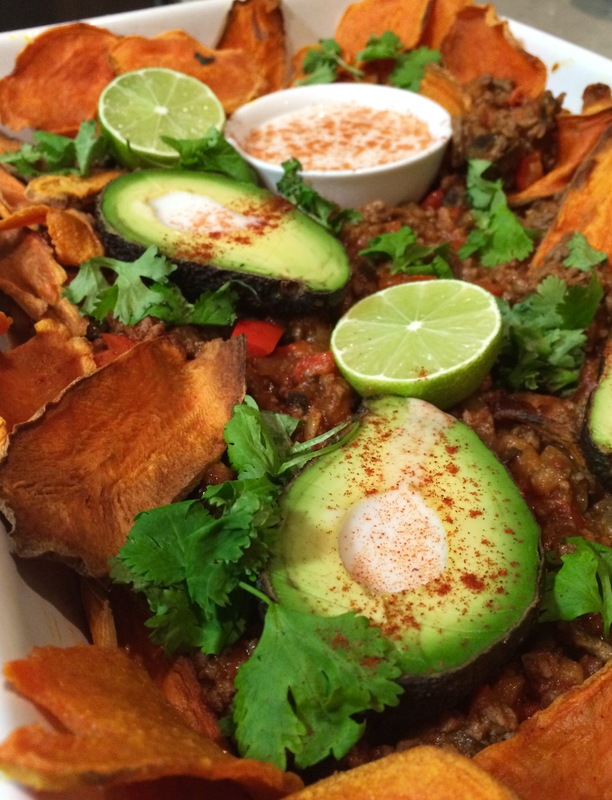 This recipe was posted recently by Jill Dupleix, a well-known food writer in Australia. I love anything with peas so I decided to make it, adjusting the quantities to go with half a kilo of mince rather than the 750g she used. It’s very quick to make and sure to be a hit with all the family. Heat oil in a large frying pan and cook onion and garlic until soft but not brown. Add meat and cook for 5 mins, breaking it up as you go, until browned. Add remaining ingredients except peas and simmer for 20 mins. 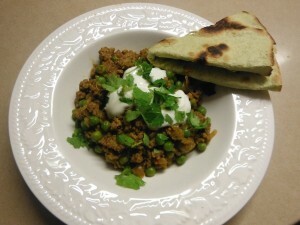 Add peas and cook for a further 5-10 mins, or until peas are cooked and Kheema is thick. Sprinkle with chopped coriander and serve with rice, bread and plain yoghurt on the side. Warm the Indian bread by heating for a minute or so on each side in a dry frying pan over moderate heat. Variations: use a drained can of beans or chick peas instead of the green peas. Aubergine is considered one of the best, if not the best, restaurant in Canberra, depending on whom you ask. Chef Ben Willis consistently uses four main ingredients to create his dishes. This contrasts with some other popular Canberra restaurants which, in my view, put too many flavours on the plate. The result is very “bitty” and not at all memorable. This recipe was inspired by a dish I was served at Aubergine recently when we were celebrating our wedding anniversary. As part of a four course degustation, the serving was small so I’ve increased the quantities to make a more substantial and certainly more rustic starter or light lunch. The four main ingredients are beef, walnuts, fig and a creamy mousse. I’m not sure how they made the mousse so I had to guess. 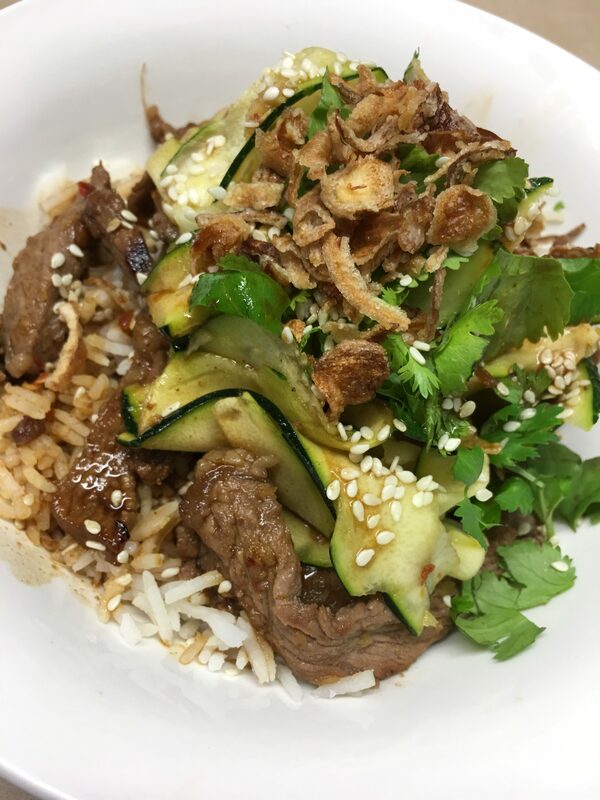 A bottle of 2013 Hilltops Shiraz from Clonakilla, one of Australia’s leading small wineries located in the Canberra district, went well with this dish. Trim meat, wrap tightly in plastic wrap and freeze for an hour, then slice very thinly and press each slice flat with the palm of the hand. Make pesto: place walnuts and garlic in food processor and chop finely. With motor running add oil through the feed chute until you have the consistency of pesto. Season to taste. Cut tops off the figs and, if necessary, trim a little off the bottoms so they sit flat. Arrange one in the middle of four serving plates. Spread some walnut pesto in a halo around each fig, then arrange some beef slices on top, slightly overlapping. Whip cream till thick then add goat’s cheese and whip just enough to incorporate. Season to taste with salt and pepper. Using two spoons or an ice-cream scoop dipped in hot water, arrange an “egg” of mousse on top of each fig. Place black sesame seeds or pink peppercorns in a spice grinder or coffee grinder and pulverise. 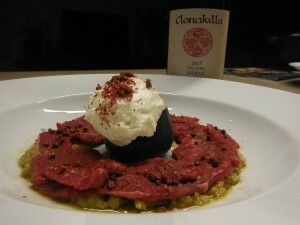 Sprinkle some over the goat’s cheese mousse and the beef. Drizzle a little lemon juice over the beef and a little Extra Virgin olive oil around the edge of each plate. Serve with fresh bread or toast. Note: to end up with a piece of trimmed fillet weighing 150-200g you will need to start with a bigger piece. I bought one kilo and after trimming ended up with the piece I used for the carpaccio, two nice thick steaks and a bag of strips to make Stroganoff, which I froze to use on other occasions. Black sesame seeds are sold in Asian shops and pink peppercorns, which and not really peppercorns at all, are available at specialty shops such as The Essential Ingredient. Black sesame seeds would have made a better colour contrast to the beef, but I had run out so had to find something else in the pantry.